There comes a time when you need to replace the batteries in your UPS and, like most consumables, sometimes they can cost more than the acquisition cost of the UPS…if you don’t know what you are paying for. Here’s what I did for an APC UPS 1400. For a mere $230 you can order a new tray with batteries. Or for about $60, you can purchase four new batteries and reuse your tray. 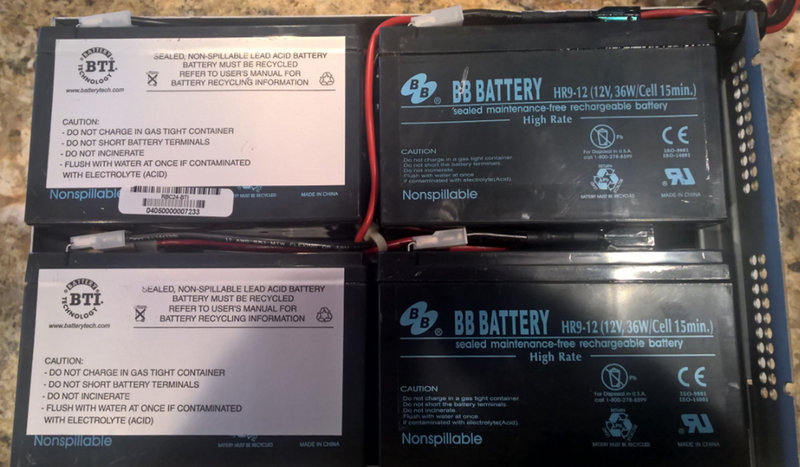 When you purchase these batteries, make sure you know whether you are getting F1 or F2 connectors on the batteries. 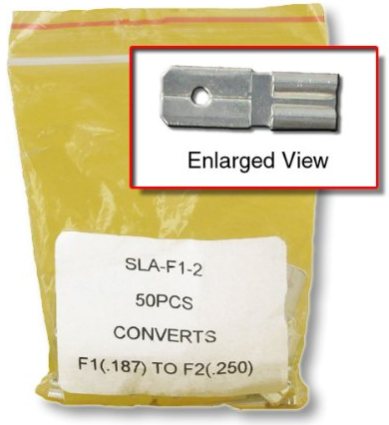 I ordered some with smaller (F1) tabs so I had to order some F1-to-F2 adapters. 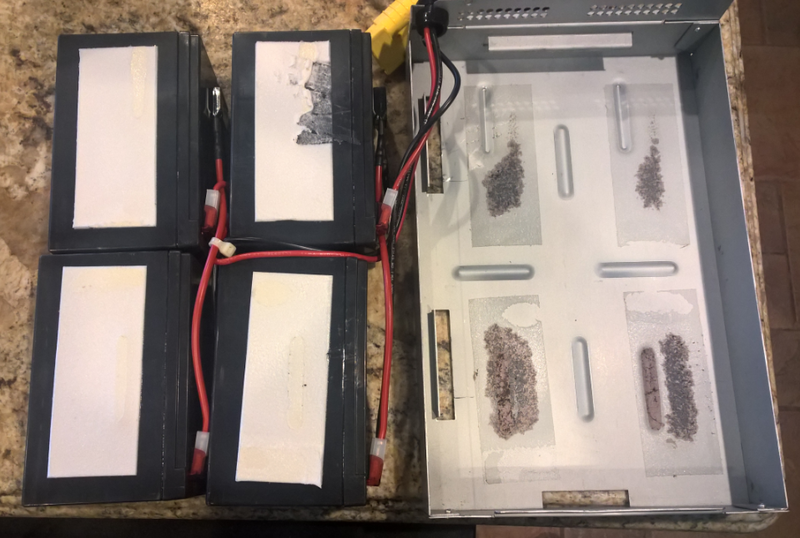 Here are the batteries exposed, after removing the label. Nothing special about these sealed lead/acid batteries. First thing is to remove the batteries. I had to think about this for a bit. They are held in place with double-sided tape. I ended up getting my heat gun out and heated up the metal side of the tray until I could pull them loose. You can see where I first attempted to pry the batteries loose. Much easier to heat up the double-sided tape and pull them out! Just be sure to hook everything up as it was. 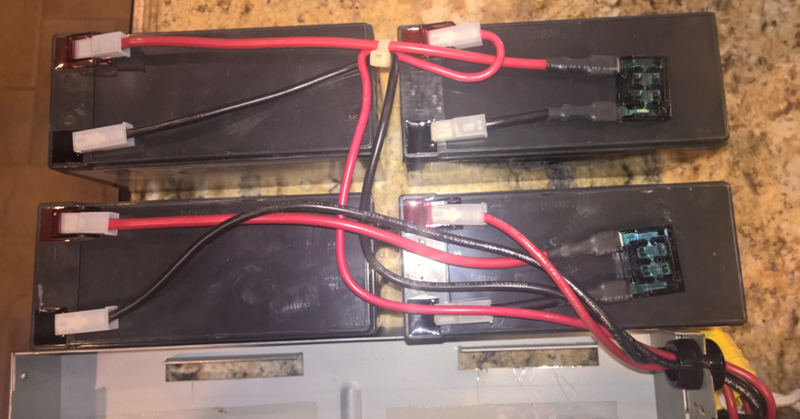 Basically, each battery pair is wired in series and then the pair are in parallel on the connector. That would make the battery tray 24v output. 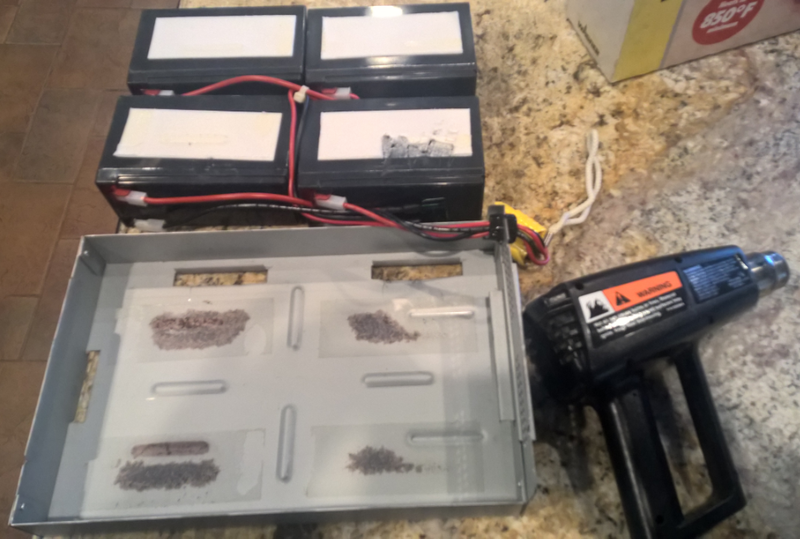 I found I could pull the fuses loose from their double-sided tape on the top of the batteries. Now all you have to do is “stick” them back in the tray. This entry was posted on January 11, 2017 at 11:07 pm	and is filed under Computer Repair, Instructions, Misc Repair. You can follow any responses to this entry through the RSS 2.0 feed. You can leave a response, or trackback from your own site.